"These small, delicious sandwiches are perfect for any party. They are so good that even the pickiest of eaters will eat these." In a bowl, mix together butter, Dijon mustard, Worcestershire sauce, poppy seeds, and dried onion. Separate the tops from bottoms of the rolls, and place the bottom pieces into the prepared baking dish. Layer about half the ham onto the rolls. Arrange the Swiss cheese over the ham, and top with remaining ham slices in a layer. Place the tops of the rolls onto the sandwiches. Pour the mustard mixture evenly over the rolls. Bake in the preheated oven until the rolls are lightly browned and the cheese has melted, about 20 minutes. 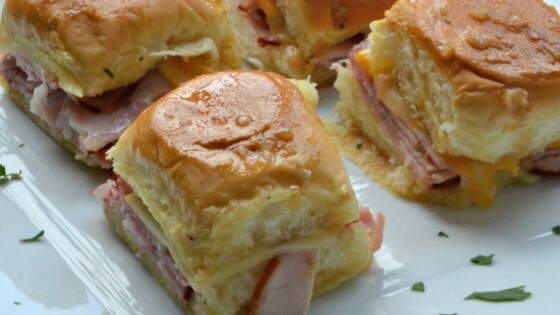 Slice into individual rolls through the ham and cheese layers to serve. I have had these sandwiches in the past and they are wonderful. Quick to fix and delicious. Great to serve at a party or small gathering.